I had an experience in church yesterday that rocked me to my core, and I want to tell you about it. I LOVE my church for lots of reasons. It is very traditional which reminds me of the little church that I grew up in in Columbiana. I love singing hymns that are a hundred years old led by a big choir. I love reciting the Lord's Prayer and the Apostle's Creed. 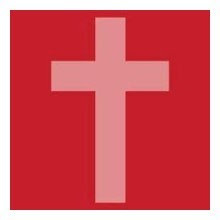 Over the last two years, I've become more involved in the church, beginning with Disciple I Bible Study last year and continuing with Covenant Bible Study currently. Through both of these experiences, I've met people that have supported and nurtured my faith and have helped me in ways I can't even number to grow in my personal relationship with Christ. 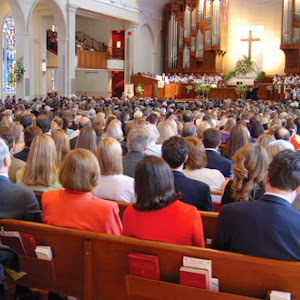 A little bit about my church...It is HUGE and is in the heart of the Buckhead neighborhood of Atlanta. If you're not familiar with the area, it is very much an upper-middle to upper class part of town, so the congregation is full of beautiful families and beautiful people dressed in beautiful clothes. Our sanctuary is equally beautiful as is the music from our choir and the message that our pastor delivers every Sunday. All of this was consistently true yesterday, but someone stood out to me in a way that I don't think I will ever forget. 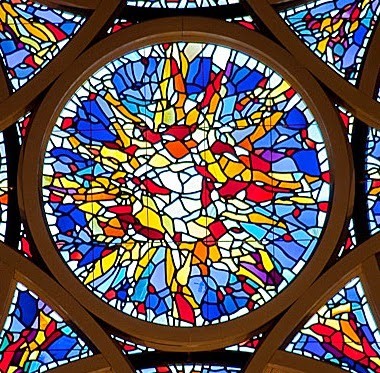 Just as the service began, a gentleman came in and sat on a bench very near me under one of the church's several stained glass windows that line the walls of the sanctuary. 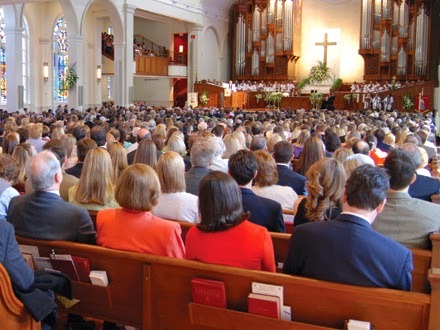 Now, most people sit in the pews that face the front of the church. The benches along the wall are usually occupied by ushers, parents with fussy babies who might need a quick exit, late-comers, and/or overflow on Easter morning. That being said, for whatever reason, I am so thankful that he chose this bench, because it was the closest one to me. Something seemed so fitting about the fact that the window over this particular bench depicts Jesus with His arms open wide sharing His Word with all who would listen from a boat on the Sea of Galilee (Luke 5:1-11). I noticed the gentleman immediately. He was maybe in his 50s (I'm terrible at guessing people's ages), and dressed in, what looked to be, his "Sunday best". He was wearing faded blue pants, tattered and worn bright blue tennis shoes, a gray button-down shirt, a red, white, and blue tie, and a black overcoat. He carried with him one of those recycling bags that they give away at Publix - it was full and the handles were tied together in a tight knot. I don't know if he was homeless, but it was obvious that he didn't have much to call his own...maybe just what was in that Publix bag. I didn't know, and I tried hard not to make assumptions about him. He participated in all parts of the service though he never used the printed bulletin for recitations or a hymnal. Typically when the Gospel lesson is read, the standard response from the congregation is, "Thanks be to God," but that was not the case for this gentleman. Maybe it was because I was acutely aware of his presence, but when he responded yesterday, I could hear his voice clearer than anyone else's as he said, "Thank you, dear God." He wasn't loud, but there was something about the way he said it. It was like he was really thanking God, and it was very unlike the response from the rest of us with our monotone words that roll off of our tongues seemingly on auto-pilot. His voice had real emotion in it. He was really thankful. The service continued into the sermon titled, Shaken by the Present. This was the second Sunday in Advent and therefore the second sermon in a series rooted in A Christmas Carol by Charles Dickens. The message centered around Mr. Scrooge's feelings of rejection and regret and how those feelings clouded his ability to see the human need around him. We are all God's children after all - none of us more valuable than the next but all of us precious beyond measure in His sight. Once we open our eyes to the needs of our brothers and sisters around us, our hearts soften with compassion, and joy is released. That's what happened to Mr. Scrooge, and that was exactly what was happening to me in that very moment. After the sermon, it was time for the ushers to collect the offering. This is one of my favorite parts of the service, because it is always accompanied by a beautiful anthem from our choir. As we prepared our offerings, I noticed the gentleman to my right working earnestly to untie the knotted handles of his bag. Once he got them released, he reached in and pulled out two coin purses. He opened the first one and it was full of little pieces of paper. He sifted through those, closed it, and set it aside. He opened the second one and began pulling coins out...as many as he could. Most of them were pennies, but there was a little silver mixed in. 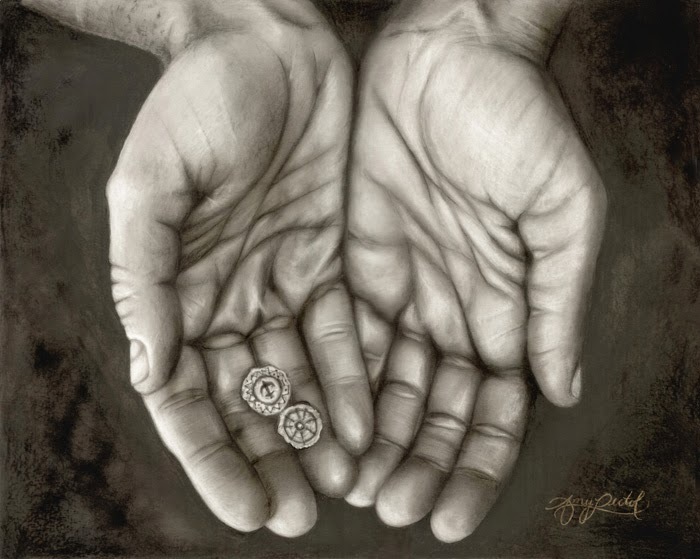 He laid his offering on the bench beside him, carefully counted it out, gathered it up in his hand, and waited to offer what he had. I was having a hard time keeping it together. In fact, I wasn't keeping it together at all. I knew what he was doing when he started pulling out the coin purses, and my tears started to flow uncontrollably. I'm talking SOBBING MESS, people. A million different thoughts and emotions were running through me and then, of course, that still, small voice whispering, "open your eyes." When the usher put the offering plate in front of the gentleman he proudly placed his gift in it. In that moment, he gave me a gift...three gifts, actually - the gift of awareness; the gift of perspective; and the gift of thanks. As we stood to sing the closing hymn, I kept my eyes straight down in my hymnal still trying to pull myself together. I took a few deep breaths and thought about what to do next. I wanted to meet this man. I wanted to know his name. I wanted to ask him to come back next week and sit with me. When I finally lifted my head up, I looked over to my right, and he was gone. In the benediction, our pastor issued a challenge to the congregation. He said to look around. Find someone in need and offer them compassion. I was immediately filled with regret that I didn't take the opportunity to talk to the man before he disappeared. I was so disappointed in myself - I could've and SHOULD'VE done more - but then I prayed. I prayed that God would bring him back next week and give me another chance to shake the man's hand that had made such an impression on me and had taught me an invaluable lesson without even knowing my name. This made me cry!! Reading it, I felt like I was the one sitting there watching...You have a gift! Thank you for sharing this experience with us!! Beautifully told Amy; a powerful story with an amazing message. I also felt like I was sitting there behind you watching the whole scene. What a wonderful story! It reminds me of my encounter with the homeless man in the parking lot downtown. Maybe you will have another opportunity to reach out to him. I hope so. But even If you don't, it is clear you got God's Christmas message!! Thanks for sharing. Your post was absolutely beautiful and had me in tears. This is just what I needed to read today. Thanks. I hope the Lord answers your prayer. This is a timely and beautiful post. Thank you for your courage to share. Amy, I think he will be back. I'm in the choir and have watched this gentleman for the past two week. When the choir has recessed around the church I have walked past him twice. He stands proud and smiles at each choir member as they pass. He is a carrier of Christmas -- JOY, as you are. Thank you for your words. He'll be back.